The endoPG locus is selected as one of RosBREED’s “Jewels in the Genome,” because this locus is contributing towards more efficient peach and nectarine breeding for desirable texture. Fruit texture in peaches and nectarines is characterized by differences in flesh softening and flesh adherence to the pit. Fruit texture defines industry market classes, fresh market or canning, and strongly influences consumer appeal. We know the controlling gene! “Melting flesh” types, which soften rapidly to a smooth buttery texture, are most desirous for the fresh market. Melting peaches can be freestone or clingstone, which describes whether flesh fibers detach from the stone (seed, pit) when fruit are ripe. If melting types (Fig. 1) carry other genetic susceptibility factors and are picked and stored incorrectly, they have a tendency to become mealy (dry and grainy); which no one likes! “Non-melting flesh” types soften gradually to a rubbery texture, and are the mainstay of peaches used for canning (Fig. 1). Non-melting types are always clingstone. Two other types soften even less: “clingstone non-softening flesh” and “stony hard” peaches, and both are suitable for fresh eating because flesh remains crisp. All of these firmer types do not become mealy. The gene controlling melting/non-melting and freestone/clingstone is known (Fig. 2) , residing at the so-called Freestone-Melting flesh locus on stone fruit chromosome 4 (Ogundiwin et al. 2009). This gene (endoPG) encodes the cell wall pectin-cleaving enzyme, known as endopolygalacturonase, and also plays a major fruit softening role in many other fruit crops; like pear, avocado, and melon. 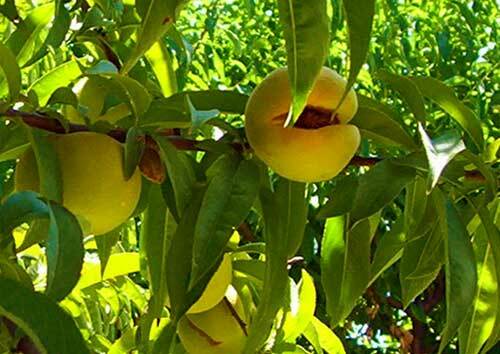 Twelve endoPG variants (alleles) have already been detected in peach, and after hunting through the USDA's Prunus stone fruit collection (plum, apricot, almond, etc) in Davis, California, more than 200 alleles were identified. Figure 2: (Left) A juicy freestone melting flesh peach. Carries two functional endoPG genes at the Freestone-Melting flesh locus. (Right) Clingstone melting flesh without the Freestone endoPG gene. Still delicious! Photo credits: Cameron Peace, Washington State University. Commercially exploitable differences in peach fruit softening profiles have been associated with different endoPG alleles. For example, one breeding line contains a unique allele associated with gradual softening over a week into a pleasing melting texture. In contrast, there are alleles from wild sources associated with immediate mushiness and others where fruit splits too easily along the suture (Fig. 3). These wild traits are undesirable and mostly have been bred out of the modern industry. However, identification of genetic markers associated with undesirable traits allows for their rapid elimination from breeding populations when breeders introduce valuable traits, like disease resistance, from wild relatives. Figure 3. Soft sutures and suture splitting are not desirable for growers and food processors. Photo credit: Cameron Peace, Washington State University. Over half the peaches grown in the US are for processing. Most processing peaches are canned, with California accounting for 96% of the total market share, making it the largest producer in the world. Unlike fresh market cultivars, which frequently change in response to market trends, processing peach cultivars entail a long-term commitment by both growers and processors because of the specialized equipment involved. The industry currently processes approximately 25 to 30 different cultivars a season, which spans the time frame of July 1 to mid-September, with a different cultivar ripening every 2 to 3 days in order to keep the processing plants running at full capacity. To be commercially viable, an acre of processing peaches must produce close to 20 tons per year (44,820 kg/ha) with an expected orchard production period of 20 years or more to be commercially successful. Located primarily in the Sacramento and San Joaquin Valleys of California, there are currently over 600 clingstone peach producers on approximately 30,000 acres (12,140 hectares). Most processing peach cultivars are non-melting clingstones (Fig. 1), because the firm flesh allows the fruit to be harvested at the preferred tree-ripe stage, transported to the processing plant, and processed without appreciable loss in fruit integrity. The ability to provide ’tree-ripe’ fruit to the market without loss in either eating quality or phytonutrient-content has also made non-melting clingstone peaches a popular fresh market fruit in Europe and Central and South America. In a clingstone peach, the flesh ‘clings’ or adheres to the stone as opposed to a freestone peach, where the stone and the flesh separate at maturity allowing the stone to be easily removed. Despite the disadvantage of the clingstone trait, clingstones are tolerated in both processing and fresh market cultivars, because of their desirable non-melting bruise-resistant flesh. Many new early-season fresh market US peach cultivars now utilize the non-melting clingstone trait for this reason. Clingstone peaches are processed for canned peaches and fruit cocktail; other products include, frozen peaches, baby food, and fruit concentrate. Ogundiwin E., Peace C., Gradziel T., Parfitt D., Bliss F., and C. Cisosto. 2009. A fruit quality gene map of Prunus. BioMed Central Genomics: 10: 587.